Teaching Elementary kids- 7 levels of lessons going fast and furious! 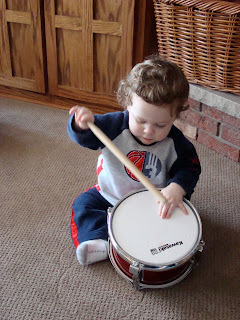 Little drummer boy... lots of music going on here in the house! Christmas preparations... were we naughty or nice? 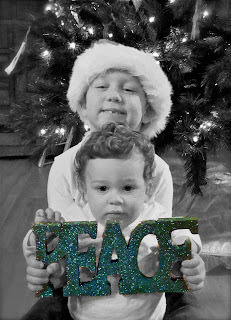 Holiday photo taking... lots more layouts to make with these cuties! So, this is just a small sampling of my crazy life. Add in shopping, wrapping, baking, parties, birthdays, relays at school, Mark's school, daycare, cleaning, and mothering and that = one tired momma! I have just started completing many projects now that Christmas is over and the parties have subsided. I will post those soon! Here are a few of my latest projects using the November Bad Girls kit! It was a wonderful kit full of fun items and gorgeous papers! I used the Golden Molding Paste that was included in the kit to "frost" the lid of the box here! The rhinestones and sequins made adorable sprinkles for the cake. This was so much fun! There was a canvas included in the kit and I transformed a doll house window into a whimsical art piece using the Graphic 45 Renaissance papers and the Molding Paste to distress the cardboard! It was fun and adding the little charms to the bottom made it very Bad Girls! This layout was inspired by my grandmother's wedding photo. She looks so classical and lovely. I loved many of the embellishments that came with the kit to add gorgeous accents to the page. Check out the details of how I made each project when you purchase the kit on the message board at Bad Girls Kits. Enjoy the beauty of the season and I'll be back this week with a Year in Review! Can you believe it's almost 2010?!! I hope this new year brings much relaxation and renewal. Beautiful work Jen! How you managed to get these projects done with all the mama stuff going on is amazing to me.. Good going. Happy New Year to you and your family.